Heart attacks strike about 735,000 people in the U.S. every year. For about 210,000 of them, it's not the first time. The Obama administration, with less than six months on the clock, is betting that changing the way Medicare pays hospitals and physicians to treat them can trim those numbers and save money. 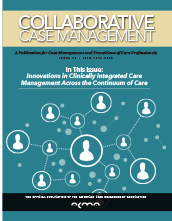 The Case Manager Practice Analysis Study supports the content and design of the Accredited Case Manager (ACM™) credentialing examination. It guarantees that exam takers will be tested on current knowledge and competencies that Case Management professionals need to perform their jobs effectively. The ACM™ is the industry standard for Case Management professionals and promotes industry-wide competency standards through a uniform national certification exam. According to the 2015 National Hospital Case Management Survey, more than half (52 percent) of all hospitals prefer the ACM™ over all other case manager credentials, more than twice that of the next preferred credential. The next ACM™ application deadline is August 15, 2016. Only days after Judy Hanttula came home from the hospital after surgery last November, her doctor's office called with bad news: Records showed that instead of traditional Medicare, she had a private Medicare Advantage plan, and her doctor and hospital were not in its network. Neither the plan nor Medicare now would cover her medical costs. She owed $16,622. Nearly 30 percent of pediatric readmissions may be preventable, according to a new study published in Pediatrics. The team reviewed medical records for 305 patients who were readmitted within 30 days to Boston Children's Hospital from December 2012 to February 2013. Researchers also interviewed clinicians and parents of the children in the study. Planned readmissions for treatments like chemotherapy were also included. CMS proposed a new mandatory bundled payment program for heart attacks and bypass surgeries that includes changes to the existing Comprehensive Care for Joint Replacement Model as part of its larger goal to shift Medicare from quantity to quality incentives. Here are 10 things to know about the proposed rule. Federal health officials urged pregnant women to stay away from a Miami neighborhood where they have discovered additional cases of Zika infection — apparently the first time the Centers for Disease Control and Prevention has advised people not to travel to a place in the continental United States. Florida officials said the number of Zika cases caused by local mosquitoes had risen to 14 from the four announced on Friday: 12 men and two women. They declined to say whether either woman was pregnant. All of the cases have been in one neighborhood.